BELIZE CITY, Mon. June 20, 2016–At least 19 members of the prominent Ahmad (Bulwer) family of Hattieville, Belize District, were hauled off by police in a Special Branch operation around dawn this morning. A spokeperson of the Muslim community told Amandala that the family members, including well-known Belize City barber Fareed Ahmad and former prison superintendent, Taheera Ahmad, as well as their elderly parents, were taken from five separate homes this morning to the Racoon Street Police Station in Belize City, where they were held until late this evening and released without any charges. On the other hand, police have kept all the family’s electronic equipment, including their laptops and cellphones, as well as their Islamic books, including the family’s copies of the Koran. Since the phones of the family members were confiscated, other family members who were trying to contact them did not know where they were. Amandala was informed that when the Commissioner of Police was contacted about the detention of the family, he indicated that he knew nothing about it. Neither did Southside commander Chester Williams, who was off today to Placencia to attend an event there. The family was only able to get intervention because an acquaintance saw the police transporting one of the family members, and proceeded to investigate the matter. Among those detained in the sweep were two pregnant women—one of them only two weeks from her due date—a retired school principal, and at least one minor. 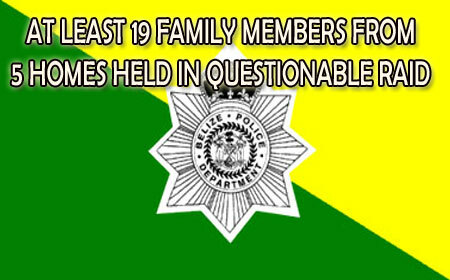 Although there has been the suggestion that the police had detained the family members on allegation of a conspiracy in connection with two of the family members, there are questions as to why an entire family would be hauled off in the manner that the Ahmad family was taken into custody earlier today. The mostly self-employed family operates businesses in Belize City, including the famous Real Barber Shop and the Real Ice Cream Shop. Amandala understands that the family, which has secured legal representation, is considering legal action.